Following the visit of a team under the Staff Monitored Programme (SMP) to Zimbabwe, the country has agreed with the International Monetary Fund (IMF) to effect critical economic policies and reforms. Compounding the problems in the country are the challenges of responding to the El Nino-related drought, which has had adverse effects on agriculture and food security, as well as the devastation from Cyclone Idai. Leon further explained that the Staff Monitored Programme aims to implement a coherent set of policies that can facilitate a return to macroeconomic stability and it will be monitored on a quarterly basis. Part of the objectives of the programme and economic reforms is to improve Zimbabwe’s frosty relationship with the international community. The southern African nation, which has been experiencing severe economic challenges for decades, has been unable to secure loans from international lenders since 1999 – when it started defaulting on its debt. As it stands, Reuters reports that the country has arrears of around $2.2 billion with the World Bank, the African Development Bank (AfDB) and the European Investment Bank (EIB). “Successful implementation will assist in building a track record and facilitate Zimbabwe’s re-engagement with the international community,” Leon noted in a statement. Paying debt arrears could potentially open access to financing from the international lenders and other development institutions, Reuters said, but the United States, which is the bank and fund’s largest member country has been and remains an obstacle for Zimbabwe. Zimbabwe has been isolated for some time now largely due to extreme U.S. sanctions. 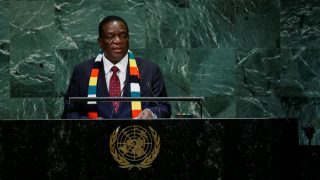 Early in March, President Donald Trump announced an extension of the sanctions against Zimbabwe by a year, saying that the new government’s policies continue to pose an “unusual and extraordinary” threat to the American foreign policy. The renewal came despite calls by African leaders, including South Africa’s President Cyril Ramaphosa, for the sanctions to be lifted to give the country a chance to recover from its economic crisis. The country’s Finance Minister Mthuli Ncube, who met with the IMF team, said the World Bank and the Fund had endorsed Zimbabwe’s plan to clear the $2.2 billion in arrears to international creditors last August. However, Ncube noted that targeted sanctions imposed on some ZANU PF (the ruling party) officials and companies appear to have prevented fresh loans to support the rebuilding of a shattered economy. President Emmerson Mnangagwa has promised to revive the economy, pay foreign debts and end the international pariah status that Zimbabwe acquired under Robert Mugabe’s near four-decade rule. This is not IMF’s first attempt at helping the crisis-hit Zimbabwe. Last year, the international economic body said it was planning to aid Zimbabwe in restoring and growing its economy. This came after the resignation of Mugabe, who is often accused of having plunged the nation into the economic crisis it finds itself.